Food poisoning can affect everyone, including toddlers. It occurs due to consumption of food or water which is contaminated by various germs, chemicals or toxins. Characteristic signs of food poisoning include nausea, vomiting, and diarrhea. In general, symptoms of food poisoning tend to resolve within a couple of days, but sometimes it may take longer. In case of food poisoning, make sure your child gets plenty of rest and fluids in order to prevent dehydration. What Are the Signs of Food Poisoning in Toddlers? Nausea and vomiting are the common signs of food poisoning. It usually lasts only a day, sometimes longer and is usually followed by diarrhea. However, in some cases, diarrhea is the only sign, without having nausea and vomiting first. A toddler needs to have at least 3 watery or loose stools before diarrhea is considered. In severe cases of diarrhea and in some infections, even blood and mucus can be present in the watery stool. In general, diarrhea lasts for a couple of days, sometimes even longer. Slightly loose stools in toddlers can persist for weeks before they return to the regular stool patterns. Abdominal pain and abdominal cramps are other signs of food poisoning. Pain tends to get better every time a toddler has diarrhea. High fever is also common, as well as pain in the upper and lower limbs, headache, etc. Your child has severe abdominal pain and cramping. Your child is constantly vomiting and does not drink or eat anything. You notice blood or mucus in your child’s loose stool. Your child looks too tired and gets confused. The signs and symptoms tend to get worse, or are not resolving even after a couple of days. Your child has other medical conditions such as heart problems, kidney problems, liver problems, premature birth, diabetes, etc. One big concern of food poisoning in toddlers is dehydration which needs immediate medical help. Common signs of dehydration include extreme thirst, fussiness, sleepiness, cold hands and feet, decreased urination, etc. In these cases, your toddler will be probably hospitalized for a couple of days and IV fluids will be administered until dehydration is resolved. 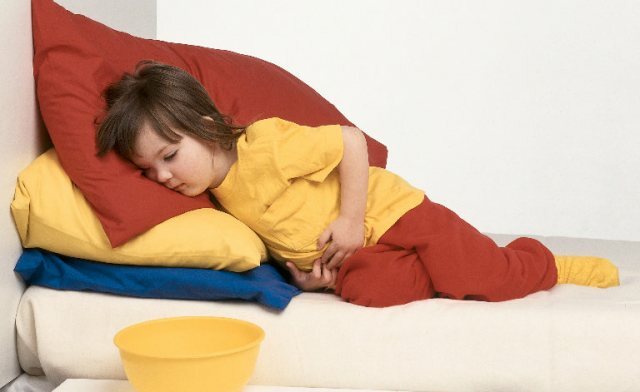 If your toddler has got a food poisoning, you will want him/her to rest as much as possible. Drinking plenty of fluids throughout the day is very important as it will prevent dehydration from occurring. Over-the-counter electrolyte solutions will do the work, taken in small sips throughout the day. Based on your toddler weight and age, your doctor will let you know how much fluids you will need to give to your child. If food poisoning in toddlers is accompanied by high fever, ibuprofen or acetaminophen is recommended as well. Never give aspirin to your toddler as it can lead to a life-threatening medical condition known as Reye’s syndrome. Nausea, vomiting, and diarrhea along with other signs and symptoms tend to last for a couple of days. Once these symptoms resolve and your child gains back the appetite, you can start feeding your child with regular food and stop giving him/her electrolyte solutions. According to the American Academy of Pediatrics, a child should return to a normal diet as soon as possible for a faster recovery. Fatty foods should be avoided, while yogurt, fruits, vegetables, lean meat, cereals, rice and bread are recommended. The so-called BRAT diet which contains banana, rice, applesauce, and toast is no longer recommended by pediatricians. It has been estimated that this diet leads to a lack of certain proteins, minerals, and vitamins needed during the recovery time. The work surface as well as the kitchen utensils should be kept clean. The hands should be washed regularly, especially after using the toilet, before starting to prepare a meal or before starting to eat. Kitchen clothes as well as dishcloths should be changed on a regular basis. Sores and cuts in the hands should be covered with a waterproof plaster before starting to prepare a meal. Don’t reheat the food more than once. Refrigerate the food as soon as possible. Don’t let it stay out for a long period of time as bacteria multiply fast. Don’t leave your refrigerates door open unnecessarily. Your refrigerator temperature should be between 0 and 5 degrees Celsius. Cool any leftover food and refrigerate it as soon as possible. Foods touch each other directly. One food drips onto the other. You use the same kitchen utensils to touch various foods, etc. Wash your hands carefully before touching another food, especially when touching raw food and ready-to-eat food. Clean the kitchen utensils before preparing raw food. Don’t use the same chopping surface for raw food and ready-to-eat food, etc.